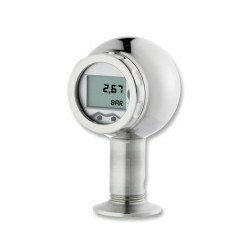 Rangeable Pressure Transmitter with an all stainless steel construction with LCD digital readout display and optional HART communications. Specifically designed for use in food, dairy, pharmaceutical or biotechnology applications where ultra clean crevice free flush diaphragms are required. The x|act i flush diaphragm adjustable range pressure transmitter can be adjusted by the user via 3 buttons located behind the laminated safety viewing glass. A turndown ratio on the output signal of up to 10 to 1 is achievable for convenient scaling in different process locations. For intrinsically safe environments there is optional ATEX approved electronics that can be specified along with HART communications if required for configuring and reading device details such as tag numbers, serial numbers, pressure range, output scaling and displayed engineering units. A selection of hygienic/sanitary flush diaphragms can be fitted with special oil fillings for use on food, drink on pharmaceutical processes. 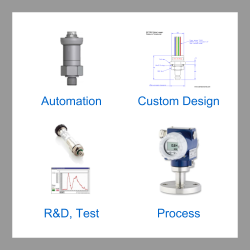 Send us your enquiry for x|act i Rangeable Flush Pressure Transmitter with LCD Readout to get assistance with this product type.